You have a furnace, and it just died. Maybe it’s old, or just had a catastrophic failure. And now you need a furnace replacement. Thomson AC is here to help. We offer just about every furnace replacement option you can imagine. If your need for a heater replacement just caught you by surprise, we have financing options available to soften the financial burden. Apply for financing here. How Much Does a Furnace Replacement Cost? Our furnace installation and replacement cost in Southern California averages $2,200. However, each installation is different. This results in slightly different costs. One discount we offer is for easily accessible furnace installation locations. Common furnace locations are in the garage, in the attic, in a utility room or possibly just a closet in your hallway. Because of this, we must come to your home to measure and inspect the entire existing infrastructure of your heating system. FAUs (Forced Air Units) handle the air for both Heating and Air conditioning. Because of this many are hooked up to an AC system. Different installation practices are needed to preserve the integrity of these other connected systems. Also, furnaces and heaters (FAU’s) are hooked up to your utilities through both gas and electrical connections. These connections need to be inspected. In most cases, we have a small amount of money allocated to making new connections to these utilities. In extreme cases, we need to change some worn out pieces and parts. This is done in order to make sure your newly installed heating system is safe and reliable. Lastly the exhaust system of your Furnace needs to be up to code. If it is found that your exhaust is made of Asbestos Transite, you will see an average quote of $450 to remove this transite pipe and install new double wall venting through the roof with a new cap, collar and flashing. There are other items that need to be inspected, and we will give you a full report of these systems while we are in your home. Changing a Furnace is no easy task. Below is a sample scope of work, so you can see what’s normally included. Remove, Haul Away, and Recycle existing furnace. Install NEW Furnace in existing location. Install a Filter Base under the new furnace for convenient and easy filter changes. Provide two filters, one in the new filter base and one extra. Wire Electrical pig tail for furnace to existing high voltage electrical outlet. Connect flexible gas line to existing natural gas supply line with a ball valve for easy shutoff. Install a Sediment Trap with a Drip-Leg / Clean-Out on the natural gas supply line prior to furnace. Most furnaces on the market come with a 10 year parts warranty. If you chose to have us install a Daikin furnace, it comes with a 12 year parts warranty. This means, with documented maintenance, (filter changes) if a part in your new heater fails, expect the manufacture to give you the part for free. You will unfortunately need to pay your service professional the labor to install the part. For this reason, Thomson Air Conditioning provides a 5 year labor warranty on all central furnaces that we install. We stand by our product and our installation, and want you to have complete peace of mind when it comes to your newly installed furnace. AFUE (Annual Fuel Utilization Efficiency) is the rating for gas fired furnaces. Think of it as gas mileage. It’s a basic fuel economy rating that says what percentage of consumed fuel is directly converted to heat. And the remaining percentage is waste. For example: A furnace with a rating of 80% AFUE perfectly converts 8 out of every 10 gallons of fuel into heat. By logical conclusion, the higher the AFUE rating, the more fuel efficient the furnace. There is no perfectly 100% efficient furnace out there on the market, However there are furnaces with ratings above 95-96% which is pretty great. 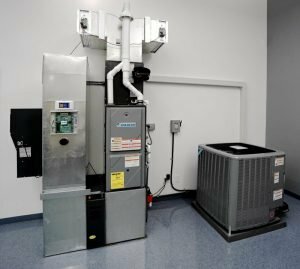 Take a quick look at this EnergySavvy.com article on the added comfort and cost savings benefits of upgrading your home’s heating furnace. The only downside to these extremely efficient furnaces is moisture. Moisture is the byproduct of complete combustion. Most homes don’t already have a way for condensed moisture to leave the home, so this becomes an issue needing a remedy. Also, the flue venting in most homes is not water tight, and therefore must be changed at the time of furnace installation. 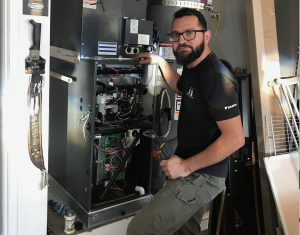 This can increase the cost of your installation, since the surrounding infrastructure of your home may need to be upgraded to accommodate a condensing, water producing, high efficiency furnace. At Thomson AC, in standard upgrade situations, the cost for this additional work is $750. This includes the $450 vent change out that we mentioned above, as well as a new condensation removal system. Often this system consists of a mechanical pump, a possible drain pan under the furnace,(if your heater is in the attic) and a condensate line that terminates in an approved location. In conclusion, look no further than Thomson AC for your furnace replacement needs in the Southern California area.. Call us at (562) 201-3014 and we will get you scheduled up with a FREE no pressure, no hassle consultation. We will provide you with an estimate on site, and get you on your way to enjoying energy efficient warmth.